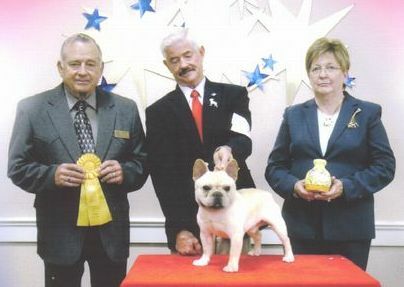 Mr Cox takes third in the Bred-By Exhibtor class at the French Bulldog National Specialty show! Coxey is full of "IT". He is a very sound young boy with lots of attitude. He has correct breed type and moves out very well. He had two majors and a BOS over specials in only a few weekends out from the 6-9 month puppy class. We have high hopes for this nicely linebred dog in the near future. Coxey takes 4th in BBE class at the Dallas/Ft Worth French Bulldog Regional Specialty preceeding the National and takes 3rd in BBE class at the National show at only 13 months old! 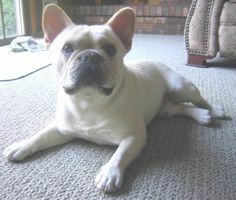 CH Hillbuckle's Chopin Southcanal, "Chopin"
CH Hillbuckle's Big Polar Tanker, "Tank"
"Deuce" ~ what a beautiful head!